Mix and Chic: Stylish and beautiful bedroom inspirations! successfully transform a neutral space into a stylish and comfortable bedroom. 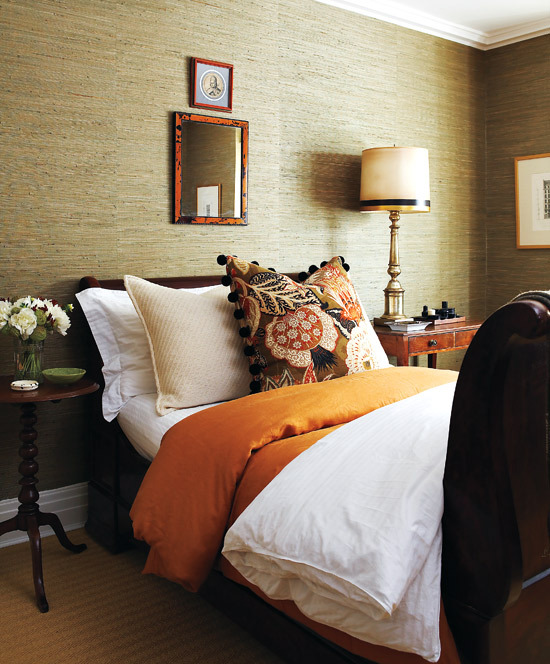 Incorporating rich colors like brass tones, burnt oranges and browns with a grass cloth wallpaper exudes a sense of warmth and sophistication in a bedroom. A tall headboard with beautiful details instantly commands attention and becomes a focal point in an otherwise simple bedroom. 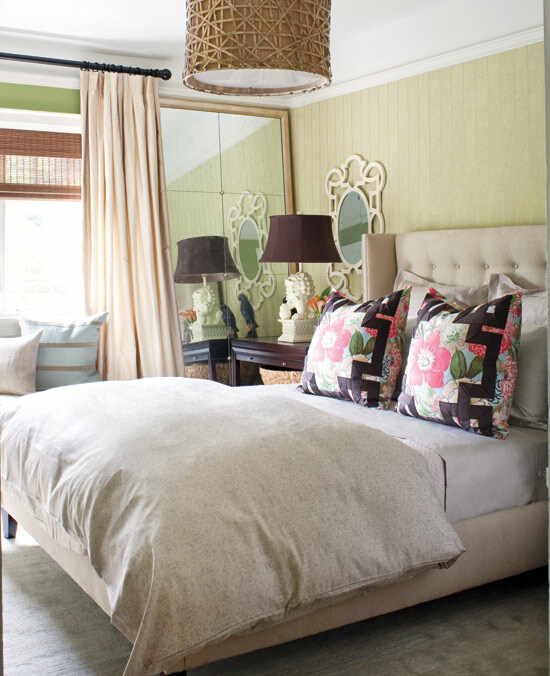 A gorgeous decorative mirror and a modern geometric bedding looks chic and adds visual interest in a symmetry bedroom. A neutral bedroom was given a fresh and stylish look with the addition of a pair of vibrant pillow shams, the unexpected criss cross pendant lamp shade and a floor to ceiling mirror. I can't decide which is my favorite! Probably the third one because I am in love with that headboard. Something like that would be so easy to recreate. From looking at these pictures I cant decide which way I prefer the bed linen! They are all different. I think I like the tucked in white sheets and the last one where it is folded and the sheets are exposed? ps- I want the bedding in the symmetrical bedroom (mine is symmetrical, I think it gives me peace, weird, huh?) and I want the pillows in the last pic with the greek key trim. GORG!! I am in love with that stylish geometric bedding too! I am just so obsessed with anything geometric lately after seeing their fabulousness all over blogland!